Managing your diet better is a good New Year’s resolution. Have your symptoms been bothering you? Do you have a plan to really control them better? Here are some easy ways to achieve what you want. Have you cut out some foods, and then a few more, but not had good enough results? This might be the time to take yourself through the diet detective process. You can add information about food reactions you know in yourself, and reactions in your family, to the Baseline Diet in my book: Are You Food Sensitive? 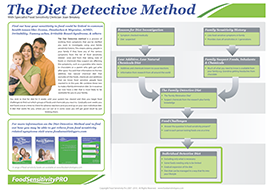 You can use the Easy Elimination Diet, the Good Results level, or the Finer Points level, so you cover all that you need to at the level of strictness that suits you at the moment. My books are available on Amazon Kindle for just $5.50, or from my site. Are you wondering if your baby or child might be food sensitive? Sometimes you feel fairly sure, and other times it does not look so clear. You may be dealing with the introduction of solids, a small person who seems happy with some foods but quite fussy in other ways, having some food reactions you suspect, or a baby or child who is supersensitive in their own particular ways: perhaps noticing strong smells, new tastes, different textures, or more general things such as bright lights or loud noises. It can all add up to a quite a muddle with family and friends giving advice. These topics are all covered in the book Fussy Baby, also just $5.50 from Amazon Kindle which helps you think it all through. Often diets are thought to be something you can do on your own, at the same time as knowing that changing what you are eating is difficult and even frustrating! You don’t expect to manage your physio on your own, especially at the beginning. Talking to someone who knows what is involved, and just loves talking food, can be just the support you need, as well as being able to answer all your questions, and think of meal plans that fit your lifestyle. Dietitians pride themselves on talking about what you can have, not what you can’t have. In Australia you can go to daa.asn.au and click on ‘Find a Dietitian’ to find one near you. You can find one experienced in food sensitivity. Could you eat more foods without your symptoms getting worse? You may be at the stage where you have done much, even challenges to see what food chemicals you react to, and have a group of usual foods, and good enough control of symptoms. But you want to have some more foods. There are many factors that can affect reactions: factors in you that stay the same, and others that vary, factors in the environment, and factors in the food itself, that all make a big difference to your symptoms. These are all explained in my book Tolerating Troublesome Foods, which also has hints on how to sneak in a little more of over 300 foods. You can choose which you want to try and read how to improve the chances of you tolerating the food. Do you want to understand your symptoms better? Are you wondering what sensitivity is all about? And for interesting stories of some very bad reactions to food see the blog especially the section on tyramine sensitivity. What is my New Year resolution to manage diet better? I would like to test the delicious fruit available in summer in Queensland. I am determined to test them one at a time and see if I can tolerate this season’s nectarines, rough leaf pineapple, mango, and watermelon. I will check the smell and taste the flavour and see if it is one I really like, and then make sure it is not acidic, or bitter at all, and that it is not overripe and musky. Even having small amounts can make a big difference to the enjoyment of food on my diet. I wish you well with your New Year’s resolutions too.